Mullen’s Bar & Grill opened in Lisle July of 2006. The Mullen’s name was inspired by a family friend, Officer Jim Mullen of the 24th District in Roger’s Park, where he provided dutiful service during his tenure. In 1996, Jim was forced to retire after he was seriously wounded in the line of duty. If you’re looking for a great all-around bar, you should check out Mullen’s (on the corner of Warrenville and Naperville roads in Lisle). The bar has a very cosy, but not cramped, pub feel to it. I like the fact that there are different areas within bar… It’s doesn’t have a choppy, sectioned-off feel, but there are quieter areas of the bar where you can go to talk and get away from the main crowd (perfect for dates). They have one of the biggest and best beer gardens around for perfect summer evenings. I should also note that as bar bathrooms go, they have some of the biggest and cleanest around. I’ve been there for dinner with family; the food and atmosphere are perfect for an informal family dinner. If you do go for dinner, try to get in and out before 8PM. The bar-crowd starts to arrive around this time and the noise level picks up a bit (but not out-of-hand loud). I’ve had fish, burgers, and sandwiches at Mullen’s; I’ve always been very satisfied with the quality, flavor, and portion-sizes of the food served. Check out the menu here. I’ve been to Mullen’s to check out local bands. They bring in some decent local bands on weekends. The stage area can be a bit cramped and loud, but there is usually enough room to dance should you want to get busy. As a music venue, Mullen’s is not the best, but it is good. As noted earlier, there are other areas of the bar to get away should the music get too loud for you – a nice option to have. 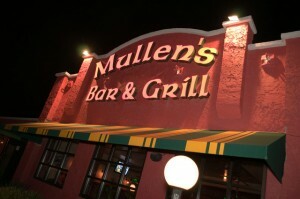 I’ve been to Mullen’s to hang-out and watch a game on a Sunday afternoon. This is probably my favorite way to experience Mullen’s, but that’s just me… It’s a relaxing, but fun place to watch a game with friends. There are plenty of TV’s to ensure you have a clear view of the game from just about anywhere you may be sitting. Check out Mullen’s, you won’t be disappointed. For more information, check out the Mullen’s website. Get a room at a local participating Hotel for only $99! Doors open at 7pm and the party doesnt stop till 3AM!